Great Britain's Katherine Grainger and Anna Watkins break the Olympic record as they seal their place in the women's double sculls final at Eton Dorney. Three-time Olympic silver medallist Grainger and Watkins, who are unbeaten since they teamed up in 2010, won their heat easily and smashed the Olympic record by nearly five seconds. 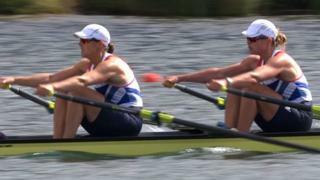 Grainger and Watkins will go for gold in the women's double sculls final on Friday. Watch a full replay of their heat here.